Media trends have witnessed a considerable shift in the MENA region over the past few years, both in terms of governance and in terms of internet penetration and its consequences. In 2017, the World Press Freedom Index ranked Lebanon as the highest country in the region with a midway ranking (99/180), followed by a sudden downward spike to Morocco (133/180), Jordan (138/180), Iraq (158/180) and Egypt (161/180). All of these countries experienced a significant drop in their voice and accountability (an important World Governance Indicator), with Iraq being the exception. This may have been due to the economic and political instability that these countries have experienced. An early study of Tunisia by the World Bank in 2010 says it has made remarkable progress on equitable growth, fighting poverty and achieving good social indicators. The statement adds that Tunisia has consistently scored above the MENA average on most comparative governance rankings and development indexes. Moreover, internet shutdowns were very costly during the Arab revolutions, with Egypt’s losses costing a staggering $90 million in 2011. Morocco would later lose $320 million in 2016 after a 182-day shutdown. When it comes to internet and smartphone penetration, the results are similar across the region: UAE leads the way with 100% penetration of internet and 99% penetration of smartphones. This is followed by a tie between Qatar and KSA in both internet penetration and smartphone penetration (93% and 95%) respectively. Lebanon follows in both studies at 84% and 90%, followed by Egypt and Tunisia. While Egypt may be behind in internet and smartphone penetration, it exceeds the other countries by far in Facebook account penetration, and users there prefer to use laptops than smartphones. How do Arab citizens get news? TV is still the main source of news in Arab countries, followed by the internet, social media, instant/direct messages, radio and, finally, newspapers and books. In fact, newspapers and books seem to be in decline as news sources in the MENA region. In terms of content, residents of Arab countries show interest in their local community, country of residence and other Arab countries at almost the same level. 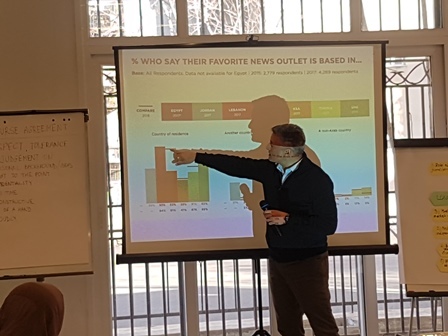 They mostly trust the mass media from their country of residence, and they mostly share and comment and engage in news, more than any other topic. News and politics websites in each country receive far more traffic than others. But the question is: who is willing to pay for news? This answer is countries whose residents have high purchasing power; the KSA comes first, and UAE comes second in this study. Arabic language in decline or at the door of opportunity? When studying the prevalence of the Arabic language in 50 websites among, KSA, Qatar, UAE and Egypt, Egypt came in first place with 30 websites that used Arabic as the primary language, followed by KSA (16 websites), Qatar (6 websites) and the UAE (1 website). While these numbers may not hint at the revolutionary growth of the Arabic language happening all over the Internet, others do. In fact, studies from the Internet World Stats show that Arabic has the largest proportional growth of any major linguistic group having grown by 158% between 2010 and 2015. When it comes to digital advertising, MENA represents a far smaller share of global ad revenues (0.3 %) than its share of global population (6%). The MENA digital ad revenues have been rising steadily since 2010, and so has its share of total MENA ad market. As for the source of these revenues, they come primarily from TV ($2.3 billions) and newspaper ($1.77 billion), followed by digital sources $550 million. Governments spend more on advertising than any industry does. In fact, governments proved to be the top buyer of advertisements with (20%) beating the companies working in toiletries and home care (9%), then shopping malls and retail (7%), then food, beverage and tobacco (11%), and then communication and public utilities(9%). Moreover, governments advertise heavily in newspapers, which have a strict geographic outreach. 66% of government ad spending go to newspapers, followed by 25% to television, 6% radio, and 4% equally split between magazines and radio. It’s worth noting that advertising in nationally focused media tend to be purchased directly by advertisers – not by media buying agencies. For example, 70% of local companies directly purchase these advertisements, as opposed to international corporates which spend nothing. There is more direct buying in radio than print, online and TV. The good news is that growth in digital advertising is making up for the decline in print. Print has seen a decline in ad revenue from 45% in 2010 to 32% in 2015. Conversely, digital revenues have prospered from 37% in 2010 to 43% in 2015. More than half of the population of KSA, Lebanon, Qatar, Egypt and the UAE believe that the internet in their country should be more regulated than it is now. The only exception is Tunisia with 39% agreement. Curiously, more than half of the population in UAE, Lebanon and Tunisia believe that it is the responsibility of each individual to avoid objectionable content. The populations of the other group, namely Egypt, Qatar and KSA believe that it is the responsibility of the government to block objectionable content. When it comes to newspapers, Egypt secures the largest share of newspaper circulation all in all of MENA with 31%, followed by Algeria with 21%, KSA with 13% and UAE with 9%. As to newspaper per capita, Kuwait, UAE and Bahrain are in the lead, followed by Qatar and Lebanon. The good thing is that newspaper’s share of total ad market remains higher in the MENA region than in global markets, even if it has been decreasing steadily in all markets. As for radio ad revenues, they are a steady 3% of total MENA ad market, the smallest of all market shares worldwide, except for an unexpected spike in 2012. Their ad revenues in the MENA region and in other parts of the world have been steadily decreasing since 2010.